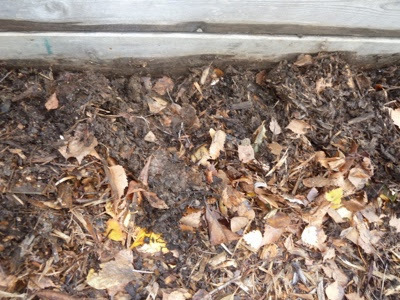 I have no idea why it is so hard to photograph a hole dug in wood chips and manure. 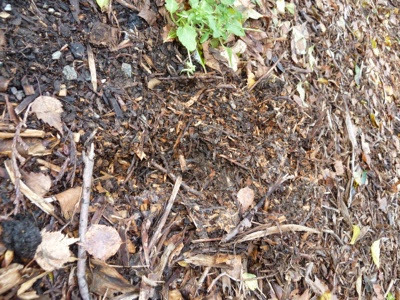 I got up today to see the full side of my strawberry bed dug down about eight inches deep. Little bugger. 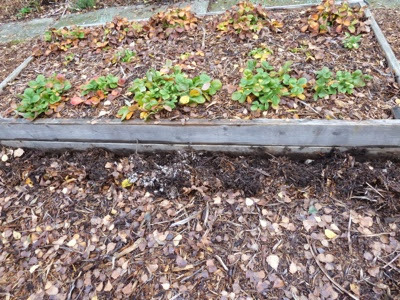 Another angle of the trough dug by the strawberries. Can't see it in this picture either. Oh well, I tried. I have taken down the bird feeder and will be moving it up to the house. He will no doubt figure it out eventually...but until then. Mwa ha ha ha. When we lived in Calgary, the neighbourhood was overrun with squirrels. They dug holes everywhere. I didn't have a garden space so planted veggies in planters but the squirrels dug up the seeds. I once saw one running across the street with a potato in its mouth. Turns out it had dug in the neighbour's garden and actually stole a large potato! Crazy squirrel was having trouble carrying it in its mouth but did manage. I was right then Joan...they are evil!! And I thought my potatoes would be safe. I didn't think anything would eat them. I just love this old masher. How do we fit in 12 for Christmas Dinner? Making the cranberry sauce tonight. A VERY cool thrift shop find! The most beautiful bee hive/box I've ever seen. Now that is a vegetable garden! !